LAS VEGAS, April 27, 2018 /PRNewswire/ -- Former NFL All-Pro Kyle Turley will be featured in the upcoming CNN "Weed" series special on medical marijuana and CBD that begins airing Sunday, April 29. Turley will be endorsing the use of cannabis and hemp products as a way to escape the addiction of opioids in the fourth installment of CNN's series on marijuana, "Weed 4: Pot vs Pills." The show, hosted by Dr. Sanjay Gupta, will debut Sunday at 8 p.m. Eastern, 5 p.m. Pacific time. 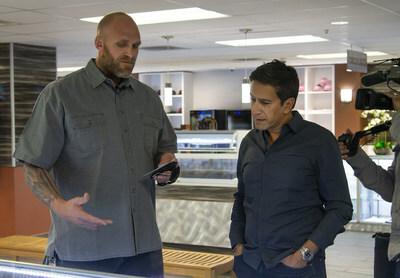 Brandon Rexroad, Shango Founder/CEO, and Dr. Sanjay Gupta tour the cultivation facility inside the Shango Las Vegas location. Marijuana is a natural and effective alternative to help people with chronic pain instead of taking addictive opioids that are costing millions of people their lives. Turley says the show takes a big step toward, "exposing the truth about this plant. People deserve the truth and I'm here to fight for it because it saved my life, the lives of my football brothers and millions of others. And unlike pharmaceuticals, THC and CBD hasn't killed a soul in the history of the world." Earlier this week, Gupta released an open letter to U.S. Attorney General Jeff Sessions, imploring him to decriminalize marijuana. The series "Weed" has helped remove the stigmas associated with marijuana and CBD, the cannabinoid that is extracted from cannabis and hemp that research is backing up anecdotal claims with medical science. "The reality is," Turley says, "the worldwide health care factor that marijuana has become can't be ignored any more. We are out here on our own proving that while the government seems content to feed us things that will kill us." Turley is the founder of Neuro XPF, a line of CBD-only products made after isolating CBD and terpenes from hemp strains to create a broad spectrum, THC-free product line. "We go the extra mile to extract all THC so any youth football player has the opportunity to use this for prevention and the college and pro athletes won't fail a drug test," Turley says. Turley uses the isolate process to withdraw THC and then keeps the whole-plant approach. "You still have the entourage effect because you have every component of the plant except THC. We all carry THC in our system and that will ignite the entourage effect." Turley's products are tested in Neuro XPF labs and through Shango Las Vegas and the State of Nevada. "Every batch coming through has a testing requirement and we go through state testing every three months," Turley said. About "Weed 4: Pot vs Pills"
The description of the fourth installment says, "Politicians promise to lead the country out of the worst drug crisis in its history, but opioid abuse continues to kill Americans in record numbers. Are our leaders ignoring a lifesaving solution? Over 115 Americans die every day from opioid overdoses, more than those killed in car accidents, from breast cancer or even guns. Nearly 2.5 million Americans struggle with opioid addiction, and though controversial, some people believe a potentially lifesaving solution may lie in medical marijuana. In the fourth installment of his groundbreaking series, CNN chief medical correspondent Dr. Sanjay Gupta takes an in-depth look at marijuana's potential as both an alternative to opioids in treating pain and in ending opioid addiction." Diagnosed with chronic traumatic encephalopathy (CTE) due to the 100-plus concussions he received during the 10 years he played as an NFL offensive lineman, Kyle Turley struggled with pharmaceutical addiction, violent thoughts and suicidal tendencies — until he started taking medical marijuana. "It saved my life," he says. "I wouldn't be where I am today, I would not have my family, my kids, my house, everything I have right now, if not for cannabis." To help save other lives, Turley founded the Gridiron Cannabis Coalition to use his story and those of other players to advance the idea of marijuana as a valid medicine for neurological conditions and other athletic injuries. He donates proceeds from sales to Gridiron Greats founded by Mike Ditka. "CBD has the unique opportunity to address the growing crisis in our football community and, this is why I created Neuro XPF." CBD (cannabidiol) has shown in studies to have neuro-protective and antioxidative properties that could address a myriad of maladies facing our military and NFL veterans while supporting the general health and wellbeing of all athletes. Knowing the value of the plant and the hurdles that the government and big pharma has placed on marijuana, Kyle Turley has created Neuro XPF, a lab-tested, federal-guideline compliant, THC-free, CBD (hemp-derived) cannabis supplement focused on Bioavailability. "Neuro XPF uses a special CO2 extracting process to isolate the CBD, working hard to preserve the terpenes to modulate the effect of Neuro XPF," he says. "This adds that little extra punch to Neuro XPF products so they taste better and provide more beneficial qualities." These products include various delivery systems and potencies based on preference and need. For more info, see www.neuroxpf.com or www.goshango.com.